How many of you knew that 2019 is the “Year of the Fly”? Apparently, flies are being celebrated all over the world and here in the UK, as the weather warms up, there are activities that you might like to get involved with. But why bother? Surely flies are just here so that birds can eat them! Erica McCalister, Senior Curator of Diptera at the Natural History Museum, knows better. So read her guest blog on the website of Mark Avery (ex Director of Conservation at the RSPB). One of the activities on at the moment is “Bee-fly Watch”. 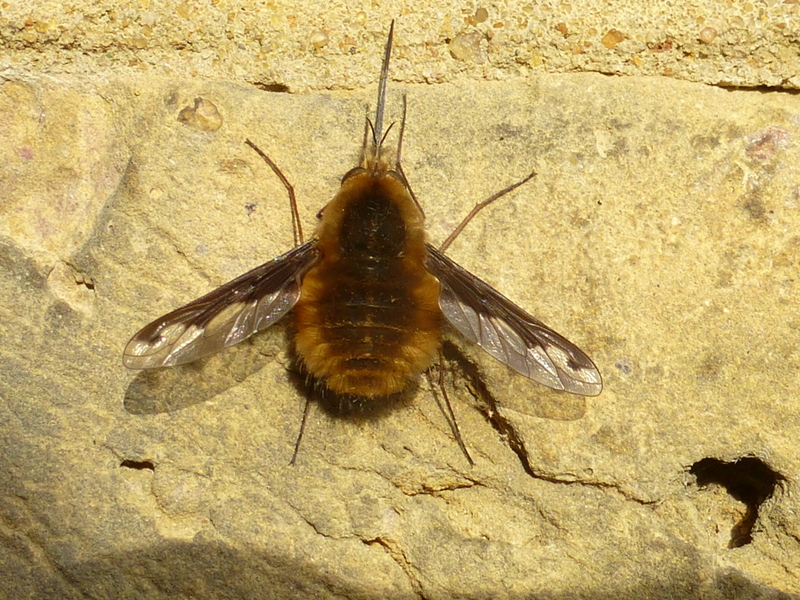 I don’t know too much about Bee-flies and I have only ever seen the commonest species , the Dark-edged Bee-fly. It gets its name from the dark leading edge of the wings. This one was on the wall of our house a few years ago. They are great to watch – either feeding at flowers or laying eggs around solitary bee colonies. 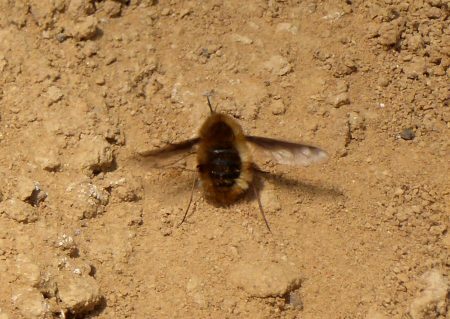 But they are a challenge to photograph – so get out there and find them, take photographs if possible, and send your records to “Bee-fly Watch”. If you get photographs send them on to me please. The Dark-edged Bee-fly often visits flowers. Watch this video of a Bee-fly in our garden a few years ago. Hopefully “Year of the Fly” will keep us busy. With over 7000 British species to find that should not be difficult. Bee-fly out and about in our garden too. They like the violets for a swift top up. Online, so many people think that their long proboscis is a ‘stinger ‘ and get worried about them. Most get the message they’re only for feeding though. One thing I like watching is the hovering. I think they’re fabulous little insects, attuned with the arrival of the spring bees and flowers. Thanks Malcolm for this post. I read the guest blog and found it very interesting and recommend it . It was not heavy going as you might imagine but informative and told with humour.